Blame it on the ever-growing trends of athleisure and streetwear, but we have an undeniable love of sneakers. From polarizing chunky sneakers to sleek slip-ons, we simply can’t get enough of this wearable shoe style. Right now, although choosing just one type was hard, we’re pairing all of our fall outfits with black sneakers. Don’t get us wrong, as we love classic white sneakers, as they’ve become an everyday staple in our closets. But take their edgier, sleeker cousin, black sneakers, and you’ve instantly given your ensembles an added cool factor. 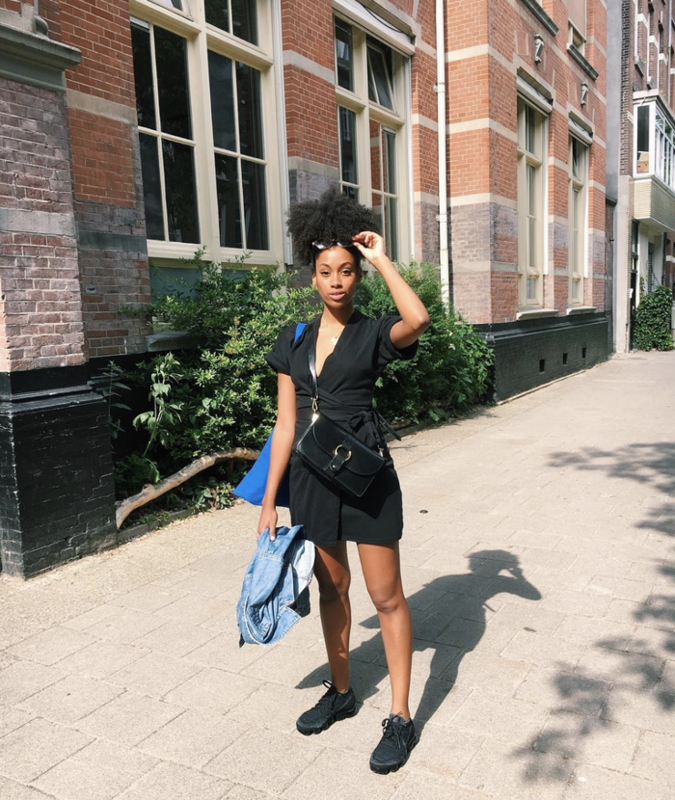 To illustrate our point, we’ve gathered some of the best looks featuring the sneaker trend from our favorite fashion girls. Wear black sneakers to finish off a monochromatic black outfit or style them as a contrast to an all-white ensemble. Or sport the look to dress down a chic dress for the day. Either way, it’s safe to say these will prove to you just how much of a regular staple these black sneakers can be in their own right. Wear a simple black dress with black sneakers for an easy monochromatic outfit. A simple wrap dress is so flattering. Take this bag everywhere you go. Complement your regular outfit with these black sneakers. The perfect alternative to an off-the-shoulder top. Yes, you can wear shorts into the fall. Throw on a pair of black Converse to give your outfit that cool factor. Brighten up any fall day with this sweater. This dress is too cute. Give your cargo pants that extra edge with a pair of black sneakers. If you haven’t already, now’s the time to own a pair of cargo pants. Sport your favorite summer dress with a pair of black trainers for any of your upcoming outdoor events. Bonus points if you style it with a fanny pack. Layer a long-sleeve shirt underneath when it gets colder. Yes, fanny packs are still a thing. A pair of black sneakers will give an all-white ensemble the perfect amount of contrast. Wear this blouse to work. The platform makes this sneaker even edgier. If you’re wearing a black skirt, black tennis shoes will give your ensemble a streamlined approach. Stock up on basic white tees. 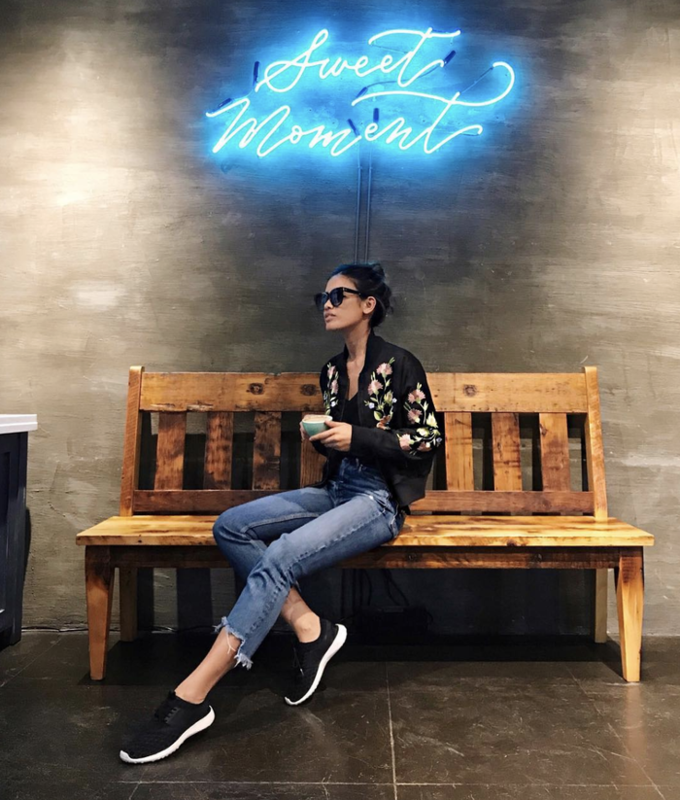 For a cool athleisure look, style your sneakers with a floral bomber and jeans. Wear this before and after your workouts. How cool is this hem detail? The simple outfit of a white tank top and black jeans will look extra edgy after you add these sneakers to the mix. We can’t get over the price of this. You’ll love these as a part of your denim collection. Add a pop of color over your all-black outfit with a bright pink coat for fall. Layer this over all your fall outfits. You’ll never go wrong with black leggings. Keep the all-black going in a denim-on-denim ensemble with your sneakers. Add this black denim jacket to your closet. We love these classic skate shoes. Or, simply wear your sneakers as if you would wear any other sneakers—these will go with anything you wear. We have no doubt this jacket will be a best seller again this year. Slip these on at any moment. See? These sneakers will become the next staple in your collection.